Ever since smartphones began earning their stripes as very adept and convenient Wi-Fi hotspots, companies and carriers have been looking for ways to halt the trend – or at the very least, charge more. A large portion of contractual agreements for our mobile devices offer "Unlimited Web Access", but are also careful to stipulate (often in the small print) that this does not include tethering. Many users have naturally looked for workarounds, using jailbreak tweaks such as MyWi and PdaNet in order to use their devices as an ever-ready ticket to the world wide web, but the opposition has remained vigilant. Unless you go down the jailbreak route – which, being unregulated, always carries a higher risk of instability – there’s really no option but to tether "legitimately", which often involves paying an extra $10-20 for the privilege of sharing locally a connection which, many aggrieved consumers feel, has already been paid for. A happy median may have arrived, though, in the form of a web-based solution called Tether. It initially surfaced back in November under the alter ego of "Tether" as a full-bodied iOS app, having somehow slipped through the Cupertino company’s stringent moderation service. At $14.99, all you needed to do was download the supplementary install a Mac app, and you could enjoy unlimited tethering via USB. Having eventually been spotted by the lens of the fruit company’s Raygun, iTether was pulled from the App Store, forcing its development team back to the drawing board. Just four months later, the app is back, and in order to avoid Apple’s iron-fist rule, it’s web-based (HTML5, no less). It costs $30 a year which – whatever way you look at it, is a great deal. Tether.com keeps data safely encrypted, and operates wirelessly – unlike its previous solution. Step 1: Sign up to the service here, and download the desktop app applicable to your OS (Windows or Mac). Step 2: Open the desktop app, follow the steps to create an Ad-Hoc network on your PC or Mac, and connect to the network from your iPhone (in Settings). Step 3: Go to tether.com/web on your device, and tap in your credentials. Step 4: Your device and your computer should communicate (you will see packet data being sent and received), and from then, you’re good to go. 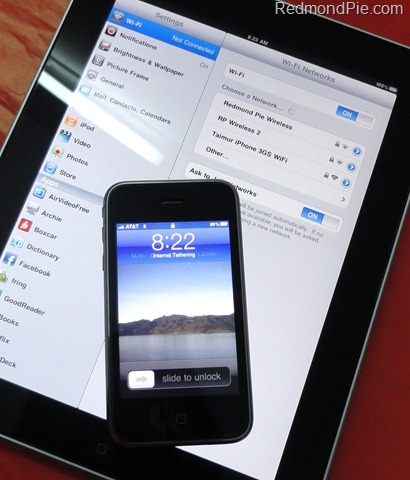 Couple of last pointers – it also works with the iPad 2, and does not require a jailbreak. Indeed, it doesn’t make the slightest bit of difference whether you’re jailbroken or not.